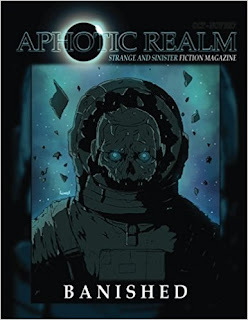 To celebrate the launch of Aphotic Realms second issue; Banished I 'm talking to Mandi Jourdan one of the many uber talented authors featured in this magazine. Aphotic Realm is the new home for dark and sinister fiction and are really going places. Their first issue, Apparitions was released in July with really positive reviews and now they're back with their second installment which features ten stories of people forced to fight for their survival after being betrayed or banished. 1) Hi Mandi, thanks for joining us, tell me how long have you been writing? I've been writing in some form for as long as I can remember. When I was in grade school, I used to write little stories and illustrate them, and when I was in about fifth graded, I started a fanfiction that opened up a lot of doors for me even though I never really showed it to many people. It made me realise how much I love to write and how much I wanted to start something serious. In sixth grade, I started what would eventually become Lacrimosa, which is the novel I have coming out now. I've rewritten it a bunch of times but I've wanted ti tell this story since I was eleven. 2) Who are your favourite authors? J.K.Rolwing tops the list. I also love Amelia Atwater Rhodes, Orson Scott Card, Cassandra Clare, Emily Bronte, Lauren DeStefano and Veronica Roth. I'm excited to have author friends now and am trying to catch up on everybody's stuff. 3) What draws you to horror? Can you remember the first book or horror film that you encountered? I feel like the imminent threat of danger makes me care about the characters a lot more than I would if I thought they were safe and makes me root for them to figure out how to get out of that situation. The first horror film I saw (in parts) was Sleepy Hollow when I was first supposed to be asleep and kept sneaking peaks at the TV. The first one I remember seeing all of was The Others. 4) Do you have any upcoming projects? My sci-fi novel Lacrimosa is coming out within the next month from Adelaide Press, and my short story collection, Shadows of the Mind (set in the same universe) is also coming soon from Aphotic Realm. I'm putting out my YA paranormal novel, The Silenced through my own imprint, Bloodstone Press. 5) Despite the characters in your story living in a world powered by super advanced technology and also having powers to communicate verbally and telepathically, they are unable to properly communicate with one another. Would you say that the art of communication and understanding is more important than making huge strides in technological advancement? I would definitely agree with that. Kadmus and Ilona are determined not to understand one another, at least initially. Each wants the other to understand that (s)he is wrong and accept a completely different version of the truth that (s)he was raised believing. Even with all their technology, each of their societies has evolved with the same mentality a lot of societies today and throughout history have or have had- we're right and anyone who disagrees is our enemy. It isn't until the two of them start to open their minds to other possibilities and ideas and listen to each other that they can really get to the root of the problem and unite against the bigger threat that comes at them later. Mandi Jourdan is the co-editor of Whatever Our Souls and the co-founder of Bloodstone Press. She graduated from Southern Illinois University at Carbondale with a BA in English/Creative Writing. 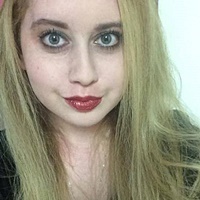 Her prose has appeared or is forthcoming in four anthologies by Sinister Saints Press, Aphotic Realm, 9Tales, Digital Science Fiction, and The Colored Lens, among others. She can be found on Amazon and on Twitter (@MandiJourdan) or at bloodandtalons.wordpress.com.